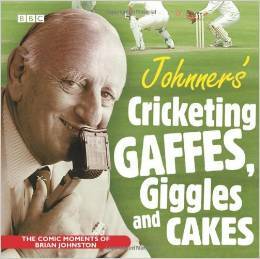 Johnners: Cricketing Gaffes, Giggles and Cakes. More giggles from the archives include Johnners’ notorious Ashes comedy song, his appearances on Quote, Unquote and Trivia Test Match, plus Fawlty Towers insights from John Cleese. From leg-pulling to leg-overs, inflatable parrots to chocolate cake, this special recording is not just for cricket lovers, it’s for anyone who loves a laugh.